In the photo above, you will note a bumble bee paying a visit to our lovely bee balm flower. 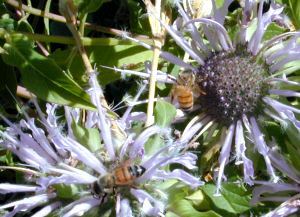 And, in the photo on the left, you will note two honey bees busy at work. Now you know why they call it BEE Balm! These beneficial bees are among the most important insects in any garden. These spicy flowers are large and colorful. Often called Bergamot, because of its citrusy flavor similar to the Bergamot Orange Tree, a tablespoon of Bee Balm flowers makes a great addition to the oil when frying white fish or scallops. Their strong flavor also goes well with meat and pork dishes. Whole flowers make attractive floaters in punch bowls of Sangria. Whole flowers also make good plate rings; surround the outside of your entrée platter with Bee Balm flowers to create a more visually appealing dish. Bee Balm flowers can be fresh frozen and will keep for two months or more. Bee Balm is a herbaceous plant, which means it dies back to the ground in the winter. Each year the base of the plant will spread as its stems spread just under the surface of the soil and set down roots. Mulching encourages this by giving the rhizomes soft dirt to stretch out in. Bee Balm leaves are very strongly flavored and should be dried before use. Add the dried leaves to black tea and make your own Earl Grey. We also like to cut big bouquets of Monarda fistulosa for making our fresh herbal summer wreaths. For instructions on how to do this, be sure to visit our Wreath Making 1 2 3 page. 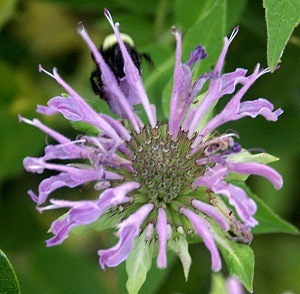 Bee Balm is one of the six plants chosen to be in our Edible Flower Herb Garden, Zone 5-11 Tea Herb Garden and is sometimes in our Crafter's Herb Garden. It also makes a great addition to our English Cottage Herb Garden. This plant is often available in plug trays. These trays hold 128 of all the same plant. They are a great low cost way to fill a lot of space. Each cell is 3/4 of inch by an inch. Check here to see if Lavender Bee Balm Plug Trays Trays are available.